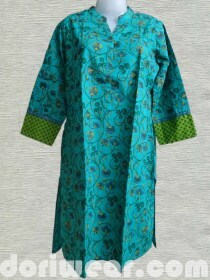 This Turquoise Printed Kurta online representing Utsa collection of kurti is by westside. The Turquoise blue shade of Utsa kurti by westside add weight to your regular ethnic wear once its place as turquoise kurta by Utsa, in your closet. 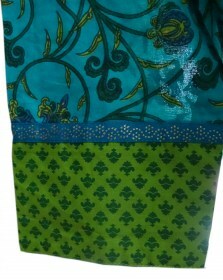 The Turquoise blue color of printed kurti is fabricated from pure cotton. 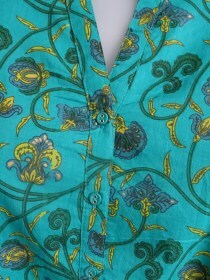 Kurti has floral print through out the kurta, while it presents a notched collar with matching color contrast pf buttons. The tab sleeve with contrast olive green shade add more pep to the ethnic wear of kurti. Above all this turquoise color printed kurti is fashioned in an A-line silhouette giving your look stylish appeal. Contact us for wholesale of ladies kurti, tops and branded garments. We have a huge lot of kurtis and ladies tops for bulk sale.